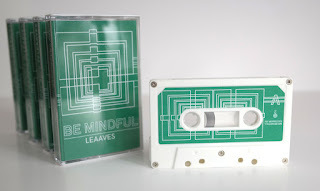 When a release entitled Be Mindful features promo text like, “Those pieces all come from a place of deep contentment, an emotion which is fleeting and easily forgotten,” you should know what you’re getting yourself into. Sure enough, ambient drifter Nate Wagner, aka Leaaves, pretty much met his perfect match in Paris-based tape label ERR REC, and the partnership resulted in eight tracks of sublime beauty that make you think, feel, and remember. That’s nostalgia – that’s what’s tapped in your brain when you turn on a Leaaves release and the music hits whatever cortex or lobe in your brain is responsible for the shimmery feels. ERR REC commissioned a heck of a graphic artist with this release (and others) as well: Bolanile Maté (related to label head Gilles Maté?) / Be Better Paris, whose white geometry on a green background and sans serif lettering underscores the simple/complex dichotomy of the entire release. Emotionally stirring while deceptively simple, the tracks are weightless and gripping in equal measure. Wagner himself is in fine form – he recorded Be Mindful on a trip to the continent, in Magny-Les-Hameaux – stretching his compositions and inhabiting them, imbuing them with his own memories and blissfully recreating moments that we’ve all had at one time or another. That’s the secret to ambient releases like Be Mindful – they have a universality that we can all relate to. Leaaves just happens to release some of the nicer and more tranquil entries into the overall canon, and this is no different.